The Winter Soldier is a pretty simple movie - Cap's working for SHIELD, something's fishy, Hydra Reveal, Wham, Bam, problem (kinda sorta, The Winter Soldier himself is sort of just left dangling at the end in favour of bringing more resolution and focus on the destruction of SHIELD) solved - and that really works in its favour. It paces itself steadily, never allows itself to lose track of itself, and deals with its story elements largely successfully. The simple structure really allows them to focus on what's needed to drive the movie, and it works really well. Amazing Spider-Man 2, on the other hand, is about two and a half great movies smooshed into one messy, merely decent one. I was worried from the trailers that it seemed like any central plotting was lost amongst the plethora of villains and the 'Peter's Parents' arc, and it's the case for the film - there's just too much going on and it means none of its really done well. Rhino begins and, weirdly enough, ends the film in hugely unnecessary moments, but it's in the combining of Electro and Harry Osborn/Green Goblin's stories into one that the movie falls flat in. There were enough interesting ideas there to form two, separate movies - but shoving them together on top of some slapdash attempts at worldbuilding for the Sinister Six (more on that later), just leaves for a messy film, even with the fun action and stellar, film-redeeming performances from Andrew Garfield and Emma Stone. The Winner is... Captain America! Whilst both movies have some really spectacular fight sequences, The Winter Soldier's fights pack a hell of a lot more of a punch than TASM 2's do. The Russo brothers do a fantastic job of selling the physicality of Captain America as a superhero, the strength of each and every one of hits is tangible and had the audience at my screening audibly gasping at some points. It's filled with some really spectacular fight moments too - the hand to hand with Batroc in the opening, the Lift fight in the Triskelion, the first knife-juggling duel with the Winter Soldier... it's all marvellously done. Spidey is also great, and filled with kinetic webswinging and fighting (the first encounter between Electro and Spider-Man in Times Square stands out as the definite highlight), but whilst it's good at selling the acrobatic and flighty nature of the athlete Spider-Man is, a lot of it also has a lot less impact, standing in harsh contrast with The Winter Soldier. Marc Webb's second outing also features a lot more CGI enhancements than the more practical work of the first film, and it shows in these fights too - it's not necessarily a bad thing, as they look great, it's just that they feel so lightweight that it ends up being unfulfilling beyond the visual spectacle. Stan Lee's brief turn as the Smithsonian Guard is both a genuine surprise and elicits a good laugh - it's short, sweet, and well done (and also hard to get a good quality picture of). Spidey's just feels a bit lazy in comparison, with Stan Lee just... there, in the crowd at Peter and Gwen's graduation. It's more of an obvious 'hey look it's Stan Lee!' thing, rather than having him genuinely integrated into the film in a small way like Cap does. Plus, it's in like, the first 10 minutes of the film. You never go full Stan Lee that quickly, Amazing Spider-Man 2. Never! Oh man, now I can start watching Agents of SHIELD again! Even though Channel 4 is still like, way behind, annoyingly. Hail Hydra! The reveal of Arnim Zola's regeneration of Hydra, and their infestation of SHIELD as an organisation, is a huge, mindblowing reveal that pretty much blasts the Marvel Cinematic Universe wide open. It's a really ballsy move for Marvel to essentially pull the saftey net of their movies out from under themselves, considering how important SHIELD had not only as a supporting role in the Iron Man movies, in Captain America, in The Avengers, and perhaps most importantly in Agents of SHIELD, and I'm excited to that pan out. Gwen Stacy's death though, is slightly less of an exciting twist - Comic Book fans know she's going to bite the dust the moment she steps out in her green coat and purple skirt, straight from the pages of the comic, but the film also constantly reminds you of the finality of Gwen and Peter's relationship, whether it's her oddly prescient Valedictorian speech about mortality and hope, or Peter's constant attempts to keep her safe lest he be responsible for her death as he was of her own father's in the first film. It's still a really well done death scene, dramatic and touching and played excellently by Andrew Garfield, but in terms of being a surprising twist, it's not as good as Hydra. As I said before, The Winter Soldier blows the MCU wide open with the destruction of SHIELD as an entity - we've had these past few movies and the show to get used to SHIELD and who they are, and then to have them suddenly ripped out of the picture, only pockets of resistance left and now largely unable to support the heroes, sets up a really interesting direction for future movies to go in. What will The Avengers 2 be like now? A future Cap movie? Agents of SHIELD beyond Season 1? It's ballsy and exciting, and just shows how good Marvel have gotten in pushing this connected universe of characters. The Amazing Spider-Man 2, on the other hand, feels like a half-assed attempt by Sony to set up its own universe, but it just doesn't work. Marvel have had the luxury of now 8 movies and a TV series to explore their universe, but trying to cram all the set up for the Sinister Six, without feeling the steadily paced build up you had with the Avengers Phase 1, just leads to a total lack of investment on behalf of the audience - you don't really care about Harry Osborn wanting to set up the Sinister Six to take down Spider-Man, because you simply don't have the time to care. And even worse, the whole shoe-horning in of that element distracts from the movie as a whole, as another thread stuffed into the tangle of stories already there. It doesn't work, and it serves to make an already pretty messy movie even messier. 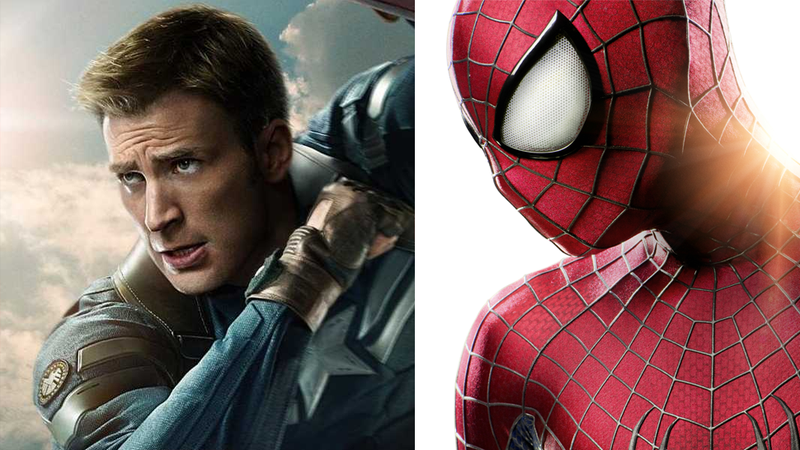 In the end I enjoyed both movies, but I enjoyed The Winter Soldier a lot, lot more than The Amazing Spider-Man 2. Despite the drubbing TWS gave it in this showdown, I think if I hadn't literally just seen such a strong movie directly before it, I might have liked Spider-Man a lot more - there's still plenty to like in there. The action's frenetic and fun and comic-booky (if weightless), it's a gorgeous looking film with some sumptuous direction from Webb again, and Andrew Garfield continues to completely nail Peter Parker/Spider-Man, offering perhaps my favourite rendition of the character full stop - although it's going to be interesting to see that going forward now that the amazing chemistry with Emma Stone is no longer going to be there. This fantastic Spider-Man just deserves way better stories to be involved in than he's getting.